Vergina is a small town in northern Greece, part of Veroia municipality in Imathia, Central Macedonia. Vergina was established in 1922 in the aftermath of the population exchanges after the Treaty of Lausanne and was a separate municipality until 2011, when it was merged with Veroia under the Kallikratis Plan. It is now a municipal unit within Veroia, with an area 69.047 km2. Vergina is best known as the site of ancient Aigai, the first capital of Macedon. It was there when in 336 BC Philip II was assassinated in the theatre and Alexander the Great was proclaimed king. The ancient site was discovered in 1976 and excavated under the leadership of archaeologist Manolis Andronikos. 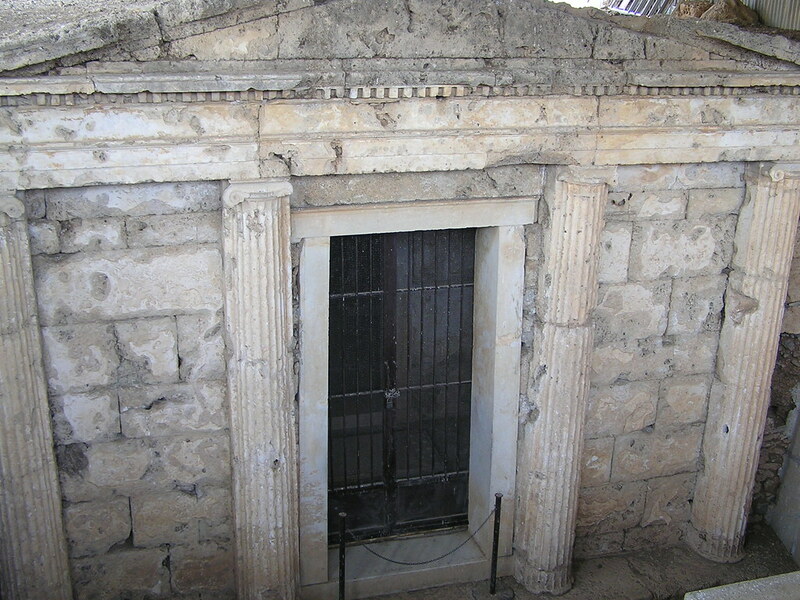 The excavation unearthed the burial sites of many kings of Macedon, including the tomb of Philip II, father of Alexander the Great, which, unlike so many other tombs, had not been disturbed or looted. It is also the site of an extensive royal palace. The archaeological museum of Vergina was built to house all the artifacts found at the site and is one of the most important museums in Greece. Aigai has been awarded UNESCO World Heritage Site status as "an exceptional testimony to a significant development in European civilization, at the transition from classical city-state to the imperial structure of the Hellenistic and Roman periods". The blue markers shows the location of various accommodations in Vergina. The letter in the marker describes the accommodation types: H for Hotel, A for Apartment, R for Resort, B for Bed & Breakfast and O for Other (e.g. pension, villa). Click on the blue marker for more information on the accommodation.